Over 90% of adults and children living with and seeking treatment for ADHD manifest cognitive dysfunction, particularly impairments in attention, working memory and executive function which provide support for a cognitive rather than psychomotor basis of ADHD pathology. 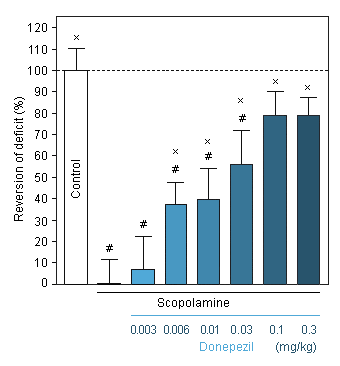 Current animal models for ADHD feature psychomotor behavior impairments (impulsivity and hyperactivity) but do not always favorably respond to the psychostimulant drugs used for the treatment of ADHD. 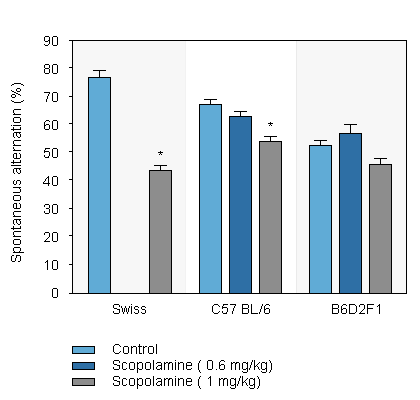 Neurofit offers an animal model of cognitive deficit in which ADHD medication drugs (methylphenidate, amphetamine and atomoxetine) fully restore cognitive performance. The model implements pharmacological alteration of central cholinergic system implicated in ADHD pathology. The T-maze continuous alternation task (T-CAT) is one of the methods implemented to evaluate the spatial exploratory performance in mice. The procedure relies on the animal's natural behaviour to explore novelty and thus alternate between right and left arms. When used in conjunction with pharmacological tools, the system allows us to evaluate memory deficits (represented by a reduction in the number of alternations) thus providing us with a useful model for screening compounds with cognitive enhancing properties. 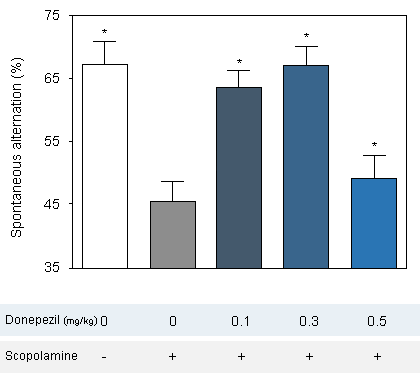 by Donepezil (0.003 to 0.3 mg/kg) in Swiss mice in the T-maze. by Donepezil (0.1 to 0.5 mg/kg) iin Swiss mice in the T-maze. 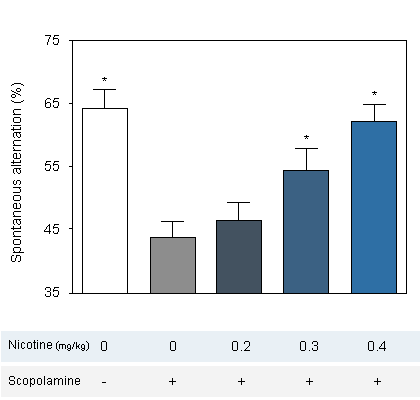 by Nicotine in Swiss mice in the T-maze. 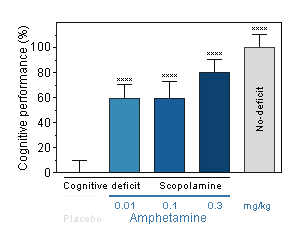 Reversal effect of Amphetamine on cognitive deficit induced by scopolamine in the mouse. Cognitive function was assessed by the ability of mice to perform spontaneous, continuous and sustained alternation in the T-maze. 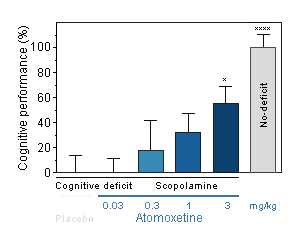 Reversal effect of Atomoxetine on cognitive deficit induced by scopolamine in the mouse. Cognitive function was assessed by the ability of mice to perform spontaneous, continuous and sustained alternation in the T-maze. 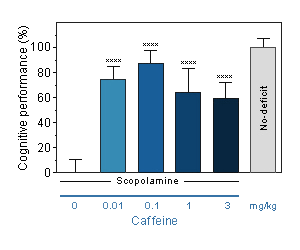 Reversal effect of Caffeine on cognitive deficit induced by scopolamine in the mouse. Cognitive function was assessed by the ability of mice to perform spontaneous, continuous and sustained alternation in the T-maze. 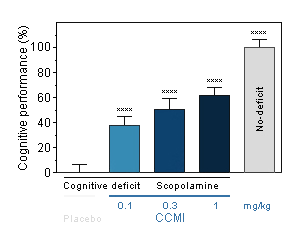 Reversal effect of CCMI on cognitive deficit induced by scopolamine in the mouse. Cognitive function was assessed by the ability of mice to perform spontaneous, continuous and sustained alternation in the T-maze. 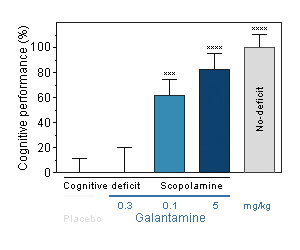 Reversal effect of Galantamine on cognitive deficit induced by scopolamine in the mouse. Cognitive function was assessed by the ability of mice to perform spontaneous, continuous and sustained alternation in the T-maze. 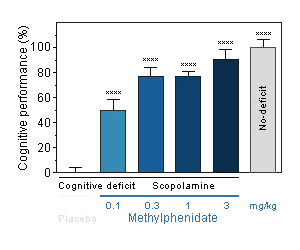 Reversal effect of Methylphenidate on cognitive deficit induced by scopolamine in the mouse. Cognitive function was assessed by the ability of mice to perform spontaneous, continuous and sustained alternation in the T-maze. 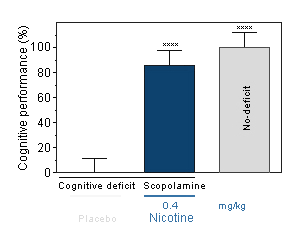 Reversal effect of Nicotine on cognitive deficit induced by scopolamine in the mouse. Cognitive function was assessed by the ability of mice to perform spontaneous, continuous and sustained alternation in the T-maze. 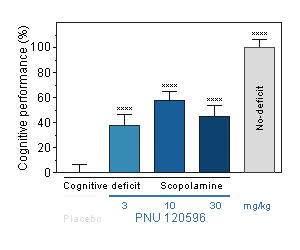 Reversal effect of PNU120596 on cognitive deficit induced by scopolamine in the mouse. Cognitive function was assessed by the ability of mice to perform spontaneous, continuous and sustained alternation in the T-maze. The open field test is a common measure of exploratory behavior and general activity in both mice and rats. The rotarod is a performance test based on a rotating rod with forced motor activity being applied.